An update on the classic Christmas cookie recipe with a fabulous flavor combination. White Chocolate Chip Snowball Cookies with Macadamia Nuts put a new twist on an old favorite. Santa loves the traditional snowball cookies recipe, but sometimes even a classic needs a bit of a change. So to combine the old and the new, I updated a popular cookie recipe by adding a fabulous flavor combination. 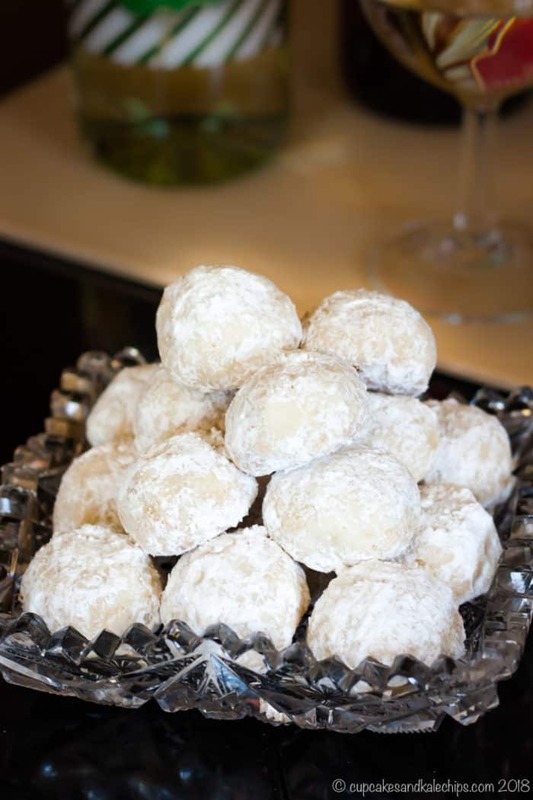 This holiday season, be sure to bake White Chocolate Macadamia Nut Snowballs. Ah, Christmas Eve. Growing up and even as an adult, it was always my favorite holiday meal. When I was a kid, we were crammed in my grandparents’ small dining room. At some point we moved to the slightly larger dining room of my parents’ old house. We eventually spread through the tiny dining room and at folding tables in the living room of my house with The Hubby. But regardless of where we were, it was pretty much the same menu. Christmas Eve is a meatless meal in my family. First we’d gather around the table, say prayers, and eat a bowl of mushroom soup. This was followed by passing around platters and bowls of pierogies, mashed potatoes, fried shrimp, corn pudding, and green beans with mushrooms. We ate till we were so loaded up on carbs that we had to push back from the table a bit to make room for our expanding bellies. After clearing the table, doing some dishes, cramming the leftovers into the fridge (because somehow we always felt the need to cook up eight dozen pierogies, even though we’d usually only eat about three or four), and exchanging some presents, out came the cookie platters. The kids grabbed their cookies and went back to playing or watching a Christmas movie. The adults would linger around the table, maybe with another glass of wine, or perhaps a cup of coffee or tea. They’d nibble on a cookie here or a cookie there. Everyone was chit chatting until we were ready to all go our separate ways for the evening. Then we would meet up the next day and feast again. Of course topped off with more Christmas cookies! The faces gathered around the table and the table we gathered at have morphed and evolved over the years. Sometimes adding people, sometimes subtracting, sometimes showing up as a special surprise. But the tradition has remained the same. That is, until this year. We just moved, family members have different work schedules, new extended families, and other obligations. So my husband and children and I may be on our own for Christmas Eve for the first time. In some ways this is sad, but in other ways it seems fitting since we will have just been in our new house for about a month. It’s time for traditions to evolve, and to make new memories. Though of course we will hold on to the old ones. We will likely have our traditional Christmas Eve dinner on Christmas Day or over the following weekend. Maybe we’ll add some steaks for a little surf and turf. A nod to the past, to the familiar, to the traditions we hold dear, but with something new and different. And hopefully just as memorable. White Chocolate Macadamia Nut Snowballs are a little blend of old and new. 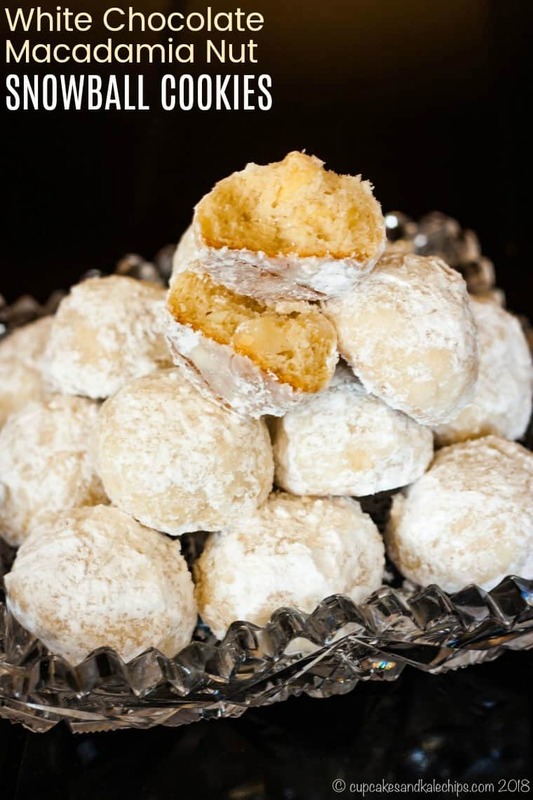 Snowball cookies have always been my mom’s favorite Christmas cookie recipe. 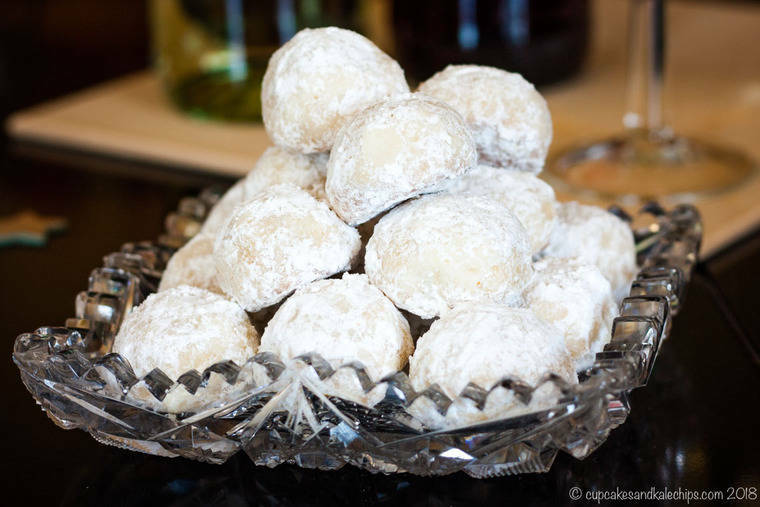 You may know them as Russian Tea Cakes or Mexican Wedding Cookies, but we’ve always called them Snowballs. I’ve always made them the same way, with walnuts, not pecans like many people do, because that’s how mom likes them. But last year I changed them up just a bit and made Toffee Almond Snowball Cookies. These were quite popular, so I figured I’d do it again. I love the combination of white chocolate macadamia nut (hello, White Chocolate Macadamia Nut Cookie Dough Dip), so I added those in to make Macadamia Nut White Chocolate Chip Snowball Cookies. You start by creaming together powdered sugar and softened butter. Gradually add the flour until it forms a thick dough. It might appear crumbly and sandy at first. Just keep mixing until it comes together. Using a wooden spoon or spatula, work the white chocolate chips into the dough. Form balls using a tablespoon of dough and place on a cookies sheet. Roll in powdered sugar. But WAIT! Read the next section to that you have the best, most perfect Macadamia Nut White Chocolate Chip Snowball Cookies. This is so critical that it deserves its own section. I can’t stress this enough, but this is the MOST IMPORTANT part of making snowballs. I mean, how can you call it a snowball if it doesn’t look like a snowball. The key is DOUBLE ROLLING! 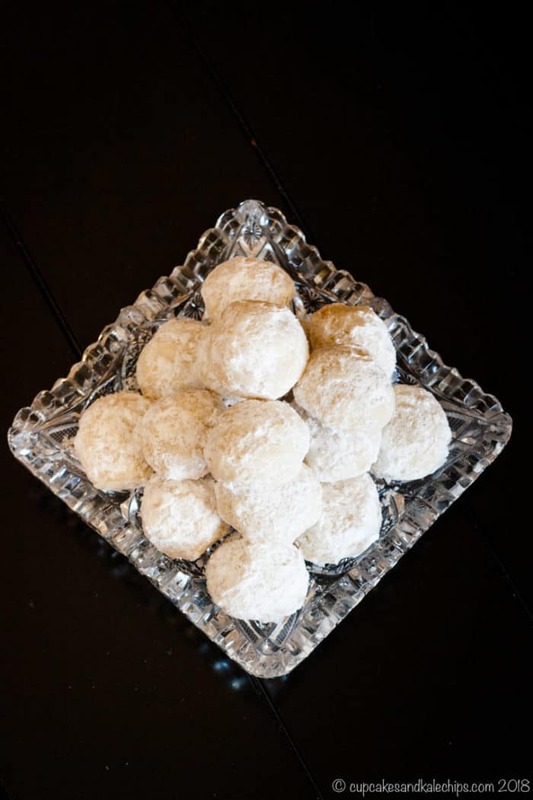 While the cookies are baking, put powdered sugar in a shallow bowl or baking dish. After they come out of the oven, let them cool on the sheet for just a couple minutes. You want the cool enough that they don’t crumble, but warm enough to slightly melt the sugar so it sticks. Place two or three cookies at a time top down in the sugar. 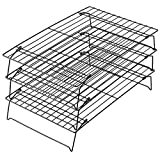 Roll each one around to coat them on all sides, then place on a wire rack. Sometimes the sugar starts to get packed down in the bowl, so loosen it up with a spoon or add more as needed. After all the cookies are coated, let them cool completely, then repeat the process with cool cookies. The first layer of sugar acts almost like a frosting or glue to adhere the second coat of powdered sugar just enough that it sticks, but that it still kinda of puffs off and coats your lips as you bite into one. That, my friends, is the joy of a snowball cookie! When it comes to holiday baking, I know many people want to get ahead of the game and bake cookies in advance. Yes, this and these 15 Recipes for Snowball Cookies are a cookie recipe that definitely does freeze well. You can either freeze the dough and bake them when you need them, or freeze the cookies. Just be sure to freeze them after rolling them in powdered sugar or it won’t stick. You could just do the first rolling, then do the final roll after you thaw them out. How about some more modern spins on traditional cookies? Orange Cardamom Coco-Doodles add exotic flavors to an all-American classic. 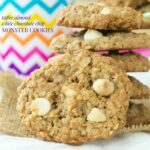 Toffee Almond White Chocolate Chip Monster Cookies take that classic flourless oatmeal cookie and swap the peanutty and chocolaty ingredients for almond butter, toffee, and white chocolate. 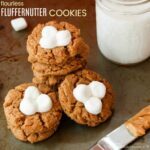 Flourless Fluffernutter Cookies aren’t your usual thumbprint cookie or a plain old peanut butter cookie. Combine two favorite cookies in one with Gingerbread Snickerdoodles from The View From Great Island. Just as tender and buttery as the classic Snowballs, but with the rich macadamia flavor and the little bursts of vanilla. These cookies are the perfect blend of old and new, traditional and modern. Santa is sure to love these cookies as much as your friends and family when you add them to a Christmas cookie platter. In a large bowl, cream the ½ cup sugar, salt, and butter using a stand mixer or hand mixer. Then mix in the vanilla. Gradually add the flour and mix until well combined. Using a wooden spoon or spatula, stir in the chopped nuts and white chocolate chips. Just like all of our families, the Gallo family has many of their own holiday meals and traditions. Of course these always include the wines of Gallo Family Vineyards. Be sure to connect with them on Facebook, Twitter, Instagram, or YouTube, and check out the store locator to try some of their wines yourself. Oh silly me! I’ve made these a million times, so I don’t know how I forgot to write where to add those. But there is no egg in this recipe, so that part is correct. Thanks! Your snowballs are a great way to blend old and new soon to be traditions! White chocolate macadamia anything is yummy! These little cookies are the perfect treat. I LOVE your new version even though I am confident the old one was, equally, delicious. I can understand your mixed emotions about this year’s Christmas celebration but I am sure that you and your family will have an incredibly special and blessed holiday in your new home. Macadamia Nuts!! What a great idea!! Plus anything rolled in powdered sugar is a win!! The double roll in powdered sugar is absolutely essential! It just wouldn’t be the Holidays without the snowballs! Love this recipe. That is definitely true in my family! Christmas Eve is our traditional dinner too. I need to make a few of these delicious cookies to share (maybe) with everyone this year! Snowballs, I would argue, are the BEST holiday cookie. I love how you used macadamia nuts. I have always used walnuts. This means I MUST give these a try and STAT. Yep, walnuts are my usual recipe too! I loved changing it up! Oh wow, well if he can only have one nut, macadamias are a great one! I love snow ball cookies! I love that you added macadamia nuts to it! Great recipe! I thought it would be a tasty twist! It’s always good to have leftover at the holidays. That said, I doubt there would be any leftovers of these cookies once you set them out! They look amazing and I love the combo of white chocolate and macadamia nuts!!! They did disappear quickly at the family party I brought them to. What lovely snowballs and I love that you used macadamia nuts. I don’t use them often enough. So good! 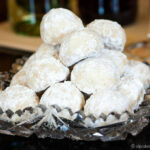 I make snowballs each year with pecans, but your fabulous version has me rethinking my recipe! Love these!!! I use walnuts every year because that’s what my mom likes, but it’s been fun experimenting! Snowballs are a great neutral base.